A robotic Russian resupply ship to service the International Space Station successfully soared into orbit today carrying two-and-a-half tons of cargo, food and water for the high-flying laboratory. The Progress freighter blasted off atop a Soyuz booster from the Baikonur Cosmodrome in Kazakhstan at 6:22 a.m. EDT (1022 GMT) and quickly disappeared into the overcast sky. The liftoff had been delayed two days because of high winds at the remote launch site. A series of precise engine firings scheduled for later today and again on Saturday will guide the spacecraft toward its automated docking Sunday at 7:58 a.m. EDT (1158 GMT). Today's launch is known in the station's assembly matrix as Progress mission 39P. 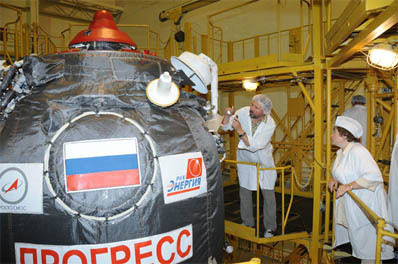 The spacecraft's formal Russian designation is Progress M-07M. The 24-foot long ship will link up with the aft port on the Zvezda service module, a spot vacated by the Progress 38P vessel that was jettisoned a week ago. That previous spacecraft will be remembered for the difficulties encountered during its initial rendezvous, causing the freighter to abort the automated docking and safely sail by the orbiting complex. The spacecraft intercepted the station again a few days later and successfully docked on the primary KURS autopilot system. The cosmonauts didn't turn on equipment in the manual TORU system during that rendezvous to prevent the interference. 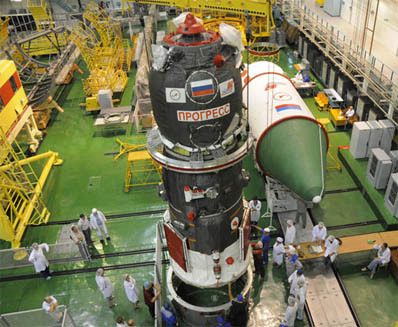 To ensure the issue doesn't repeat when the new Progress 39P arrives Sunday morning, Russian engineers made a slight modification to the manual docking system's activation time so it occurs as late as possible, just prior to the final test of that so-called TORU equipment. The change should prevent any inadvertent signals from the automated KURS docking system from interfering with TORU's power up. The docking is supposed to happen with the autopilot in control. However, the manual system is brought online as a "hot backup" for the crew to engage with a moment's notice. The cargo-delivery vehicle is hauling two-and-a-half tons of supplies to the station. The "dry" cargo tucked aboard the Progress amounts to 2,645 pounds in the form of spare parts, life support gear and equipment hardware. The refueling module carries 1,918 pounds of propellant for transfer into the Russian segment of the complex to feed the station's maneuvering thrusters. The vessel also has 375 pounds of water and 110 pounds of oxygen and air. It'll remain attached to the station until December 20. The cosmonauts spent time Tuesday reviewing procedures and conducting refresher training on operating the TORU system just in case it is needed. Orbit Insertion 0/00:08:45 6:31:42 a.m.
(19.72 m/s) 0/03:39:22 10:02:19 a.m.
(12.27 m/s) 0/04:19:47 10:42:44 a.m.
(2.00 m/s) 1/0	1:02:12 7:25:09 a.m.
(16.249 m/s) 1/23:30:21 5:53:18 a.m.
(1.155 m/s) 1/23:52:29 6:15:26 a.m.
(24.076 m/s) 2/00:15:42 6:38:39 a.m.
(Range 80 km) 2/00:20:57 6:43:54 a.m.
(Range 15 km) 2/00:41:57 7:04:54 a.m.
Orbital sunrise 2/00:43:44 7:06:41 a.m.
(Range 9 km) 2/00:47:37 7:10:34 a.m.
(Range 8 km) 2/00:48:57 7:11:54 a.m.
(Range 3 km) 2/00:56:37 7:19:34 a.m.
(6.476 m/s) 2/00:57:14 7:20:11 a.m.
(Range 2 km) 2/00:59:17 7:22:14 a.m.
(5.328 m/s) 2/01:01:42 7:24:39 a.m.
(2.293 m/s) 2/01:04:17 7:27:14 a.m.
Start flyaround 2/01:07:23 7:30:20 a.m.
Start stationkeeping 2/01:17:23 7:40:20 a.m.
Start final approach 2/01:24:03 7:47:00 a.m.